Efficient advocacy promoting treatments for those suffering from Duchenne Muscular Dystrophy catches Washington’s attention in short order. Last spring, “The Race to Yes” advocacy campaign marshaled a variety of digital tools to swiftly and successfully promote its cause—to persuade the FDA to pursue accelerated approval of safe and effective therapies for Duchenne Muscular Dystrophy. One in 3,500 boys in the United States suffers from the disease, which results in gradual loss of muscle function and death by a person’s early 20s. In a targeted campaign blast lasting only two months, “The Race to Yes” organizers created the online headquarters and brand http://theracetoyes.org and employed social media tools to convey video, infographics, and blogs that supported advocacy efforts. YouTube videos received a cumulative 8,500 views. The group’s Facebook page garnered more than 5,000 likes. On Twitter, “Race to Yes” acquired 564 followers, including celebrities Sarah Jessica Parker, the Allman Brothers, and Drew Carey, who retweeted in support. The centerpiece of the campaign involved its success in gathering 100,000 online signatures within 30 days using the White House petition portal. The FDA got the message; its commissioner publicly acknowledged the campaign and took concrete steps toward accelerated approval for a promising therapy. 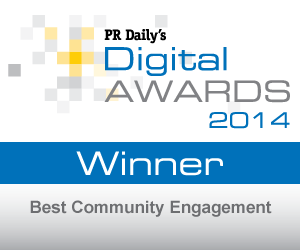 Princeton Strategic Communications team and “The Race to Yes” wins PR Daily’s 2014 Digital Award for Best Cause Advocacy for effectively tapping all available digital tools and wasting no time in getting to “yes.” The FDA response made big news, hitting the front of The Washington Post and garnering online coverage in more than 60 digital print and broadcast outlets. They spotted a win, and we did too. We congratulate the team that collaborated on the winning effort: Donna Mullins, Norris Clark, Scott Cole, Jeff Coleman, Annie Celotto, Stephen Drachler, Karen Geisel, Corey Graham, Chelsey Penrod Hickman and Scott Mackenzie.